This time of year can be stressful for many reasons--family, financial burdens, and the sometimes dreaded table talk. But it doesn’t have to be that way! 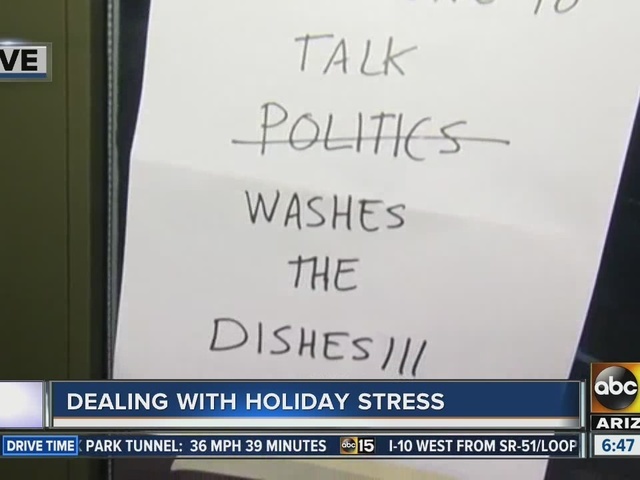 ABC15 talked with a life and business coach for some tips on how to deal with it all. Getting ready to see family you haven’t seen in ages, or ones you wish you could see, can bring on a whole host of emotions. There’s a lot of details to take care of when prepping for a big meal and gathering. But do yourself a favor, and don’t sweat the small stuff. "People want connection, not perfection. So if you burn the rolls, go with it. Don't get into a moment of freaking out,” said Dena Patton, a life and business coach. Let’s face it, it’s an expensive time of year with holiday shopping. Set a budget, and stick with it. Or go the alternate route. “Three years ago we shifted from giving gifts to giving lessons, experiences and trips to our child, and it changed the whole Christmas meaning,” Pattson said. “When you get into a situation that you might be in a conflict or triggered, don’t go there. Have the self-discipline to have grace and patience to not go in further into that conversation,” Patton said. If you find yourself overwhelmed, give yourself a break. Take a moment--even if it’s a minute to calm down and avoid a meltdown, Patton suggested.